Not surprisingly with the spine of the team serving suspensions United finished the year on a losing note as high flying Hampton & Richmond Borough scored a 4-1 victory at the Beveree. The first half really belonged to the hosts with United very much playing second fiddle, it was therefore somewhat surprising that the scores were level at the break as United equalised with a right wing James Mulley cross that deceived keeper Matt Lovett. 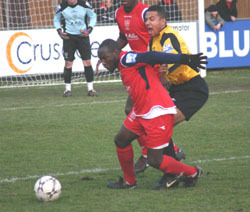 The Beavers started briskly and just two minutes had been played when Ian Hodges turned Danny Allen-Page but his shot was comfortably saved by Delroy Preddie. 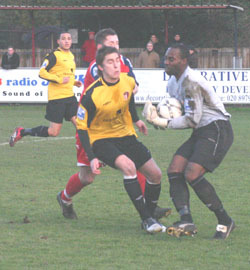 Less than ten minutes later Preddie was again called on, this time he was quick off his line to block at the feet of former Hayes FC man Shaun McAuley. The home side continued to pressure the United back-line, Peter Collins' headed clearance fell to Jack Jeffrey but the United defender recovered to block his shot before the home side finally took the lead on 26 minutes. A long free-kick was pumped into the area from halfway, the ball looked to be Preddie's but a bounce just in front of him saw the stopper relinquish the ball and Graham Harper was on hand to ram the ball home. Just five minutes later Preddie found Jack Jeffrey coming at him inside the United area, the striker unleashed a goalbound shot that the keeper did very well to block as well as having the agility to bounce up and catch the loose ball before a home player could pounce. Then with just four minutes of the half remaining United scored what can only be described as a shock equaliser, not only in the way it came but in the fact that it was the first effort the visitors had produced. James Mulley received the ball on the right flank and proceeded to play a cross that sailed over Lovett and nestled in the back of the net. Sadly the luck of an equaliser did not stir United at the start of the second half and after just 46 seconds the home side restored their advantage. Jack Jeffrey cut inside from the left before perfectly playing McAuley through and he duly beat the oncoming Preddie. 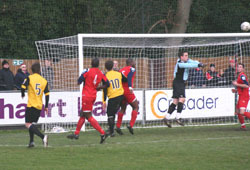 United did have their best spell of the game after going behind and could twice have found the net, Mulley raced forwards from midfield before feeding the ball to Staforde Palmer whose drilled effort from 20 yards appeared to strike a defensive hand but pleas for a penalty were waved away by referee Rathbone. Just minutes later Palmer again fired goalwards from 18 yards but this time Lovett grasped his effort albeit at the second attempt. With United pushing forwards, it was McAuley again who was to increase his sides lead, this time against the run of play. A long punt forwards saw Jack Jeffrey edge past Steve Perkins, unfortunately Preddie had also raced from goal and was caught in no mans land as the ball was crossed for McAuley to volley home into a vacant net. For the next ten minutes it was virtually one way traffic as United were clearly rattled, McAuley was inches away from a hat-trick as his drive went wide of the post and a long ball forwards found Jack Jeffrey who forced a diving save from Preddie. Just a minute later McAuley was even closer to his hat-trick when a dipping drive from 25 yards beat Preddie but came back off the foot of the post before Ian Hodges shot wide. Fifteen minutes of the game remained when the woodwork again saved United. The irrepressibleJack Jeffrey, on loan from Premiership West Ham, found space once more on the flank, his cross was met by the diving Hodges who was denied by the upright before Francis Quarm's follow up was well saved by Preddie. The final ten minutes of the game saw United carve out a couple of half chances, Simon Martin headed weakly wide from a deep Ram Marwa cross and Chris Arthur saw a shot from 20 yards dip just over the crossbar. Sadly in between these two efforts the Beavers found the net for a fourth time. 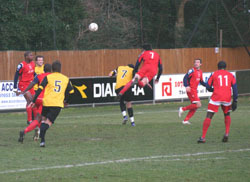 The build up started in somewhat fortuitous fashion when a 25 yard strike from Harper that was heading for the corner flag was stopped at the feet of Hodges, his shot was superbly saved by Preddie and the ball was scrambled off the line in the ensuing melee before it fell to Quarm who rammed it high into the United net.